Spotify Listeners — Drive Like a Boss … You're Worth It! You Are Here: Home > Spotify Listeners — Drive Like a Boss … You’re Worth It! Spotify Listeners — Drive Like a Boss … You’re Worth It! 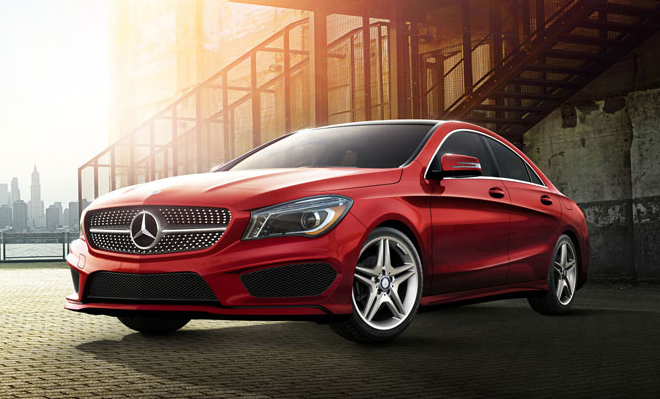 Take a look at the CLA 250, the GLA 250, or whatever you heart desires. The CLA 250 Concept Style Coupe set the auto show circuit abuzz with its dramatic design and athletic presence — bringing an international sensation to life — from its diamond-block grille to its frameless door glass to its sweeping taillamps, all at a down-to-earth price. LEASE DETAILS:Available only to qualified customers through Mercedes-Benz Financial Services at participating dealers through September 30, 2015. Not everyone will qualify. Advertised 36 months lease payment based on MSRP of $34,725 less the suggested dealer contribution resulting in a total gross capitalized cost of $33,900. Dealer contribution may vary and could affect your actual lease payment. Includes Destination Charge and Premium 1 Package. Excludes title, taxes, registration, license fees, insurance, dealer prep and additional options. Total monthly payments equal $11,844. Cash due at signing includes $2,499 capitalized cost reduction, $795 acquisition fee and first month’s lease payment of $329. No security deposit required. Total payments equal $15,138. At lease end, lessee pays for any amounts due under the lease, any official fees and taxes related to the scheduled termination, excess wear and use plus $0.25/mile over 30,000 miles, and $595 vehicle turn-in fee. Purchase option at lease end for $21,877 plus taxes (and any other fees and charges due under the applicable lease agreement) in example shown. Subject to credit approval. Specific vehicles are subject to availability and may have to be ordered. Please always wear your seat belt, drive safely and obey speed limits. The most compact SUV to wear the Star earns it in a big way. Its bold design fuses function with passion. Its nimble size delivers an ideal mix of flexibility, fuel-efficiency and fun. And its advanced engineering delivers true SUV capability with industry-leading innovations. LEASE DETAILS: Available only to qualified customers through Mercedes-Benz Financial Services at participating dealers through September 30, 2015. Not everyone will qualify. Advertised 36 months lease payment based on MSRP of $35,325 less the suggested dealer contribution resulting in a total gross capitalized cost of $34,551. Dealer contribution may vary and could affect your actual lease payment. Includes Destination Charge, Premium 1 Package, Becker MAP PILOT® Pre-Wiring and Becker MAP PILOT®. Excludes title, taxes, registration, license fees, insurance, dealer prep and additional options. Total monthly payments equal $11,844. Cash due at signing includes $2,499 capitalized cost reduction, $795 acquisition fee and first month’s lease payment of $329. No security deposit required. Total payments equal $15,138. At lease end, lessee pays for any amounts due under the lease, any official fees and taxes related to the scheduled termination, excess wear and use plus $0.25/mile over 30,000 miles, and $595 vehicle turn-in fee. Purchase option at lease end for $22,608 plus taxes (and any other fees and charges due under the applicable lease agreement) in example shown. Subject to credit approval. Specific vehicles are subject to availability and may have to be ordered. Please always wear your seat belt, drive safely and obey speed limits.